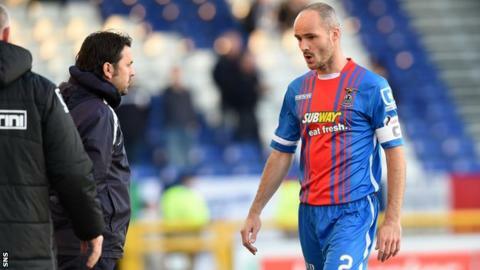 Dundee manager Paul Hartley believes referee Brian Colvin was "conned" into awarding Inverness Caledonian Thistle a penalty in their 1-1 draw. Greg Tansey equalised after Ryan Christie went down - cancelling out Rory Loy's opener from the spot. "The referee has been conned because that is not a penalty," Hartley said of referee Brian Colvin. "He's totally been conned. There's no contact whatsoever. The player has gone over very easily." Caley Thistle had to play much of the second half with 10 men after David Raven was red carded for the challenge on Greg Stewart that led to Loy's penalty strike. "It's frustrating because I felt he just wanted to make amends for giving us a penalty," Hartley told BBC Scotland. "We should still see the game out, but that's a massive decision in the game." Hartley refused to single out midfielder Christie for criticism. "The player has to do what he has to do," he said. "They're trying to get his team back into the game. "I'm just disappointed in the linesperson also. The linesman also has a fantastic view of it, he's right in line with it and surely he's got to help him out." Caley Thistle manager John Hughes was delighted that his side managed to battle back for a point despite being down to 10 men. He conceded that his side should not have had the penalty "in a million years" but did not think Dundee should have been awarded one either. "The game was spoiled by the red card," said Hughes. "I don't think it was a red card. I don't think it was a penalty. "David Raven got a toe poke on the ball. That's enough. Danny Devine is around on the cover. "I don't think there was a penalty in the game." Hughes conceded he is running out of options in terms of personnel with striker Miles Storey the latest missing through injury. Defender Gary Warren did make a late substitute appearance, returning from an injury sustained in the opening Premiership game of the season. "We need to start getting on a winning run and need to do it with the players that we've got," added Hughes. "No excuses. "I felt we dominated the game whole first half and, if we had kept 11 players on the park, we would have won the game. "The sending off changed the whole dynamic of the game. "It might be a little bit of luck by getting the penalty that we might be looking for just to kick start us."